This post is in response to Systemic Disorder commenter Palloy who thinks that peak oil will save mankind and that global warming “will not be as bad as +1.5°C.” I want to answer the question of what degree of warming we are already committed to if industrial civilization were to disappear off the face of the Earth right now. …Human activity modifies the impact of the greenhouse effect by the release of airborne particulate pollutants known as aerosols. These include black-carbon soot, organic carbon, sulphates, nitrates, as well as dust from smoke, manufacturing, wind storms, and other sources. Aerosols have a net cooling effect because they reduce the amount of sunlight that reaches the ground and they increase cloud cover. This is popularly known as “global dimming”, because the overall aerosol impact is to mask some of the warming effect of greenhouse gases. …The estimate of 40 years for climate lag, the time between the cause (increased greenhouse gas emissions) and the effect (increased temperatures), has profound negative consequences for humanity. However, if governments can find the will to act, there are positive consequences as well. This “committed warming” of past CO2 emissions whose effect will be manifested in the coming decades is about 0.6 degrees Celsius. Adding up the current warming of 0.85°C from the onset of the Industrial Revolution, the loss of aerosols with global dimming at 1.2°C, and the “committed” temperature rise from the 40-year lag time of CO2 emissions equal to 0.6°C, we get a total of 2.65°C. If all industrial activity stopped right now, we would already be committed to 2.65°C, a global average temperature rise of three times what we are currently experiencing. With all the drought, flooding, hurricanes, landslides, fires, and other manifestations of climate change that we are undergoing now, I shudder to think what the world will be like in 2050 and yet humans continue to burn coal and other fossil fuels at breakneck speed. According to the Climate Accountability Institute, half of all emissions have been produced in the past 25 years. (1) An increase in temperature decreases the area covered by sea ice as it melts leaving a larger area of exposed ocean. (2) This decreases the reflection of sunlight as ice is far more reflective than the newly exposed ocean. (3) Reduced reflection increases the area’s absorption of heat from the sun. (4) This increases the temperature of the area, amplifying the original increase in temperature mentioned in (1). A recent study calculated that the loss of Arctic ice reflectivity from 1979 to 2011 added an amplifying feedback to human warming equivalent to 25% of the heat captured by CO2 emissions during that same time. We know that we don’t live in a linear world and that climate change is a non-linear phenomenon. Recent studies on abrupt climate change in Earth’s history reveal that temperatures have changed rapidly by 5°C in just 13 years. With the grand experiment mankind has irrevocably and haphazardly embarked on, the de-thawing of vast stores of permafrost and clathrates measured in the gigatons has commenced, creating the possibility for a sudden catastrophic release of such gases at any time. 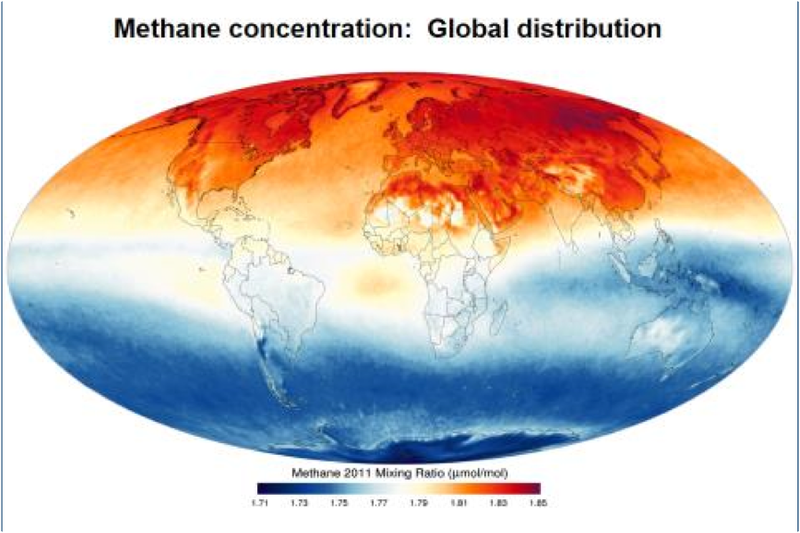 Methane, for about the first 10 to 20 years of its initial release before it breaks down into CO2, is many fold more potent as a greenhouse gas than carbon dioxide. Humans are too busy calculating everything in terms of economic profit with regards to newly exposed resources and shorter shipping routes in the Arctic to take the time to fathom what damage they have done. Industrial civilization has permanently disrupted the stable period known as the Holocene within which mankind and civilization have been allowed to prosper. Thus, we can see that the world is changing quickly into an environment that may well be outside the habitability for humans. The timing of human near-term extinction is likely academic. Journalist Dahr Jamail & Professor Peter Wadhams say the resulting release of methane will lead to massive climate disruption, and that we have reached a point of no return. …The research, published Wednesday in Environmental Research Letters, provides policymakers and economists with a new perspective on how fast human carbon emissions heat the planet. Back-of-the-envelope estimates for how long it takes for a given puff of CO2 to crank up the heat have generally been from 40-50 years. But the new study shows that the timeframe for CO2 emissions to reach their maximum warming potential is likely closer to 10 years…. One of the reasons for the Arctic’s rapid temperature increase is that it is not being shielded by industrial pollutants that once came from the Northern Hemisphere. The aerosol effect is now coming primarily from the burning of poor quality coal in Asia(China and India). From roughly 1940 to 1980 there was a massive increase in power production during the Great Acceleration of the West. Remember the acid rain and smog from the 50’s and 60’s? In 1970, the U.S. Congress imposed acid emission regulations through the Clean Air Act which was strengthened two decades later in 1990. Sulfate and nitrate levels in precipitation decreased by some 40 percent since that time. This lifted the manmade protective aerosol shield, also called “global dimming”. 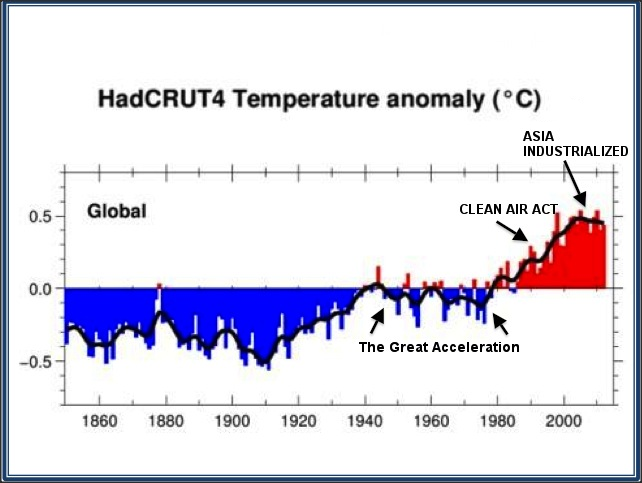 Temperatures then started to rise again, but have leveled off since 1997 due to the recent industrialization of China and India, the effect of which has been to artificially cool down global temperature once more. The effects of global dimming have been enhanced during this period [Asian Industrialization] by the mixing of more surface heat down to deeper ocean water, by the dominance of La Nina (cooler) conditions in the Pacific, and by a prolonged period of minimal solar radiation. The absence of temperature increase has also blocked all amplification from the temperature-dependent feedback mechanisms. 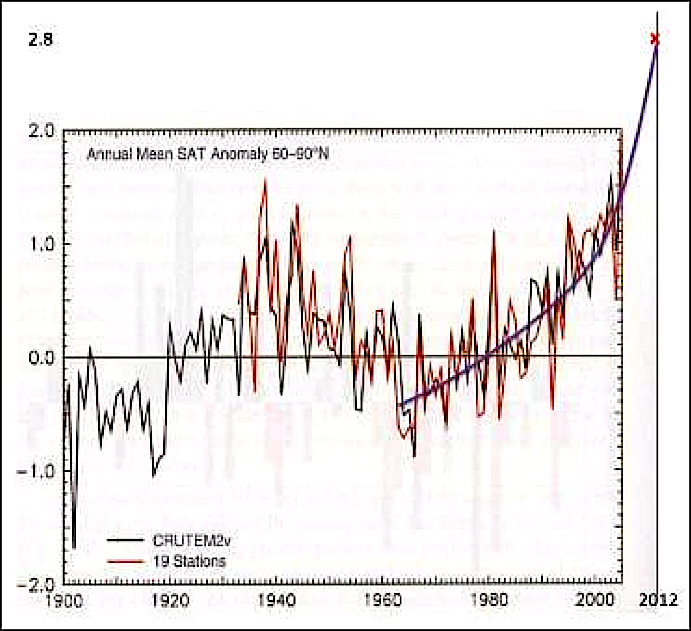 Climate-change deniers are of course crowing and saying “Although carbon dioxide concentrations have gone on increasing, and emissions are running at a higher rate than when temperature was still rising, temperature has not changed. So obviously it is independent of carbon dioxide. So we can forget all about climate change and continue to use fossil energy without any worry about contributing to global warming!” That is a complete and utter myth! Remember what happened after the Second World War? The same thing is happening today. So what happens when Asia, specifically China, cleans up and improves its air quality? Global temperatures will rise again. The worst-case prediction by current climate models of an ice-free Arctic by about 2075 are way off mark because they employ crude linear extrapolations that do not account for complex, self-reinforcing feedback loops. the Arctic will actually experience its first occurrence of zero ice area at the end of September 2015 according to Wasdell’s studies. 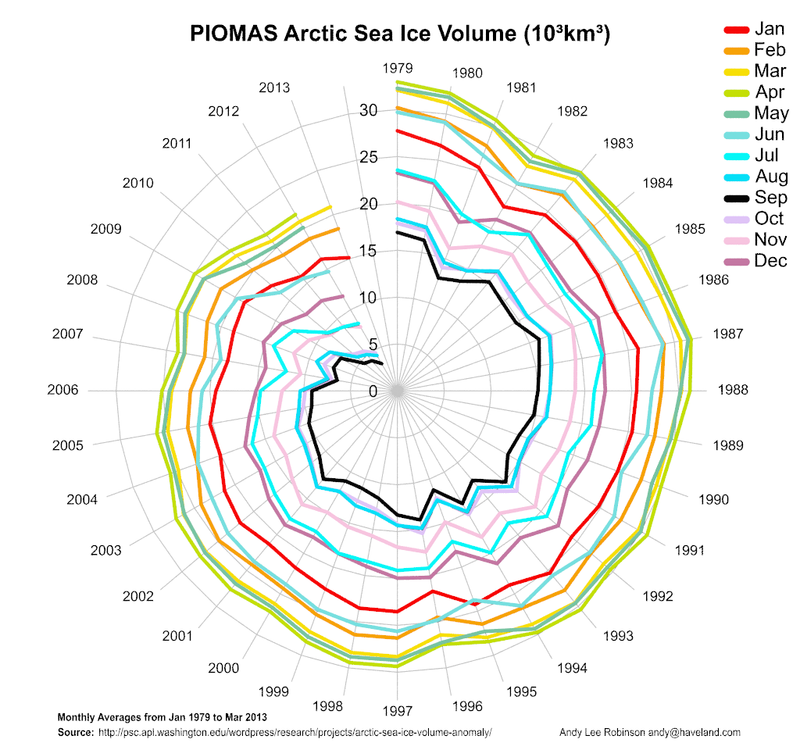 Through the use of submarine-based sonar measurements and satellite data, a PIOMASS graph of yearly minimum Arctic ice volume or mass has been constructed which also shows the first occurrence of no floating Arctic sea-ice in 2015. 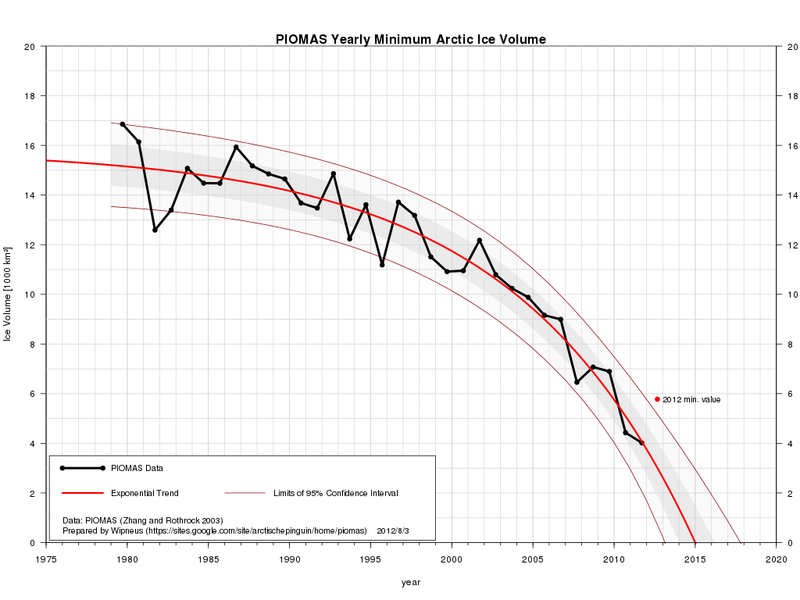 Another graph, known on the internet as the Arctic Death Spiral, shows the collapse in the total volume of Arctic ice measured in thousands of cubic kilometers. The center of the graph is zero and the values increase up to 30km3 as you move out from the center. Each year is represented from 1979 up to 2013 in a clockwise orientation. Each month of the year has its own color and is plotted in a clockwise fashion as well. Being the month with the least amount of ice cover, September is the innermost line represented by the color black. You can see that September ice volume plunged from 7km3 in 2009 down to 3.3km3 in 2012. Indeed all months of each successive year are pulling downwards towards the center of zero ice volume. 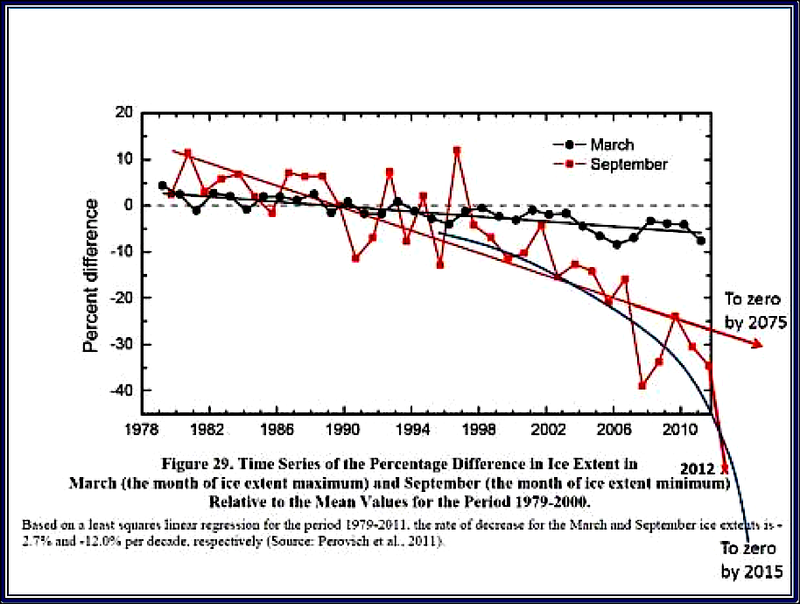 According to these calculations of total ice volume melt, the first year of an ice-free September moves up one year earlier to September 2014. Ice does not just melt and thin gradually to a wafer as would be implied in these projections. When it reduces to about 45 centimetres thick it begins to break up under the impact of waves and tides and storms. The result is a lot of brash, smaller broken pieces of ice. Now broken ice of this nature melts very much faster because warmer water and warmer air and solar energy can get round to its exposed surfaces. The melt-rate increases dramatically. These curves that we have been exploring take no account of this final break-up. So, while we would expect the first occurrence of zero ice by the end of September 2014, there is a distinct possibility that under the impact of ice break-up (of which interestingly we were already seeing signs in March 2013) the Arctic Ocean could be ice free at the end of September in 2013. – Runaway Climate Change in the Arctic: The CO2 trigger has set off multiple factors such as the water-vapour feedback, the ice-albedo feedback and other positive feedback loops to exponentially accelerate ice loss in the Arctic as shown in the above graphs. – Increasing Ice-Free Window: As mentioned earlier, September is the month with the least amount of ice and each successive year has seen a smaller and smaller volume of ice at that time. We are approaching the year when September will be ice-free, leaving the door open for the sun’s rays to heat up the ocean and further accelerate ice loss in the Arctic. This is like a burglar getting a foothold in a door that has been cracked open, allowing him to use his crowbar to fully pry open up the door that was once safely closed. An ice-free month of September that will soon open up in 2014 or 2015 will allow the sun’s solar energy to expand that ice-free window year after year after year. – Accelerating Temperature: The expanding ice-free window described above will accelerate average temperatures upwards year after year after year, intensifying all feedback loops. – Tundra Impact: Warmer Arctic temperatures flow over the land, melting tundra permafrost and releasing methane as well as activating bacteria which feed on exposed dead vegetation which in turn release even more CO2 and methane. The melting Tundra takes longer to refreeze in Autumn which further decreases snow cover. Melting Tundra releases warm waters which runs off into the northern seas, warming and desalinating shallow coastal surface waters. – Methane Release: Wave energy, tidal behaviour and storm effects from a warming and increasingly ice-free Arctic are acting to disturb ancient methane deposits at the sea floor. These methane deposits are called “clathrates”, a combination of methane and ice crystals. The warmer the water gets, the more methane is allowed to reach the water’s surface and escape into the atmosphere. Fossil ice filled with ancient plant matter and detritus is also beginning to melt and release methane. The combination of Tundra methane and deep-sea methane escaping into the atmosphere further increases the greenhouse effect, enabling methane release to speed up and create an even more potent greenhouse effect. Thus another runaway feedback process has been activated. – Melting Greenland Ice-Cap: The melting is accelerating and releasing water into the glacial cracks and down into the base of the ice sheet, enabling the calving of glaciers and discharge of icebergs into the sea. …So the collapse of the ice-sheet could become exponential and could happen quite quickly. As that occurs, large quantities of cold fresh water are discharged into the North Atlantic and that can have significant effects on the drivers of the Gulf Stream, the thermohaline circulation. As that slows down (and we would expect it to under these conditions) then the heat that at presently comes via ocean currents to the north- western seaboard of Europe begins to decline. In a strange anomaly, the rate of change of temperature in north-west Europe will slow down as Arctic temperatures climb. – Sea-Level Rise: The melting of the Greenland ice-cap would have catastrophic consequences for civilization and its large percentage of coastal urban centers. Up to about seven metres of global sea-level change could happen on a decadal basis. The West Antarctic ice field is also subject to melting and disintegration, although at a much slower pace than Greenland, which would act to raise sea levels even higher. And that is where the nub comes. With extreme unpredictability food production is disrupted in the bread-baskets of the northern hemisphere. We are talking about the corn and wheat-producing areas of North America and Europe, of Russia and the Ukraine, and across to the wheat and rice producing areas of northern China. We have already seen major loss of food production capacity in the northern hemisphere as a result of what has already taken place. Over the next few years that will accelerate significantly. There are economic issues; there are humanitarian issues; there are political issues that all stem from that instability. We are already seeing hedge funds and pension and other investment funds buying up future food in anticipation of future shortages and high prices that all stem from this phenomenon. That means it is going to be very difficult for the poorer countries of the world to buy food on the open market to enable their populations to survive. It will be even more difficult for the Aid agencies to buy up surplus food (which is in short supply and much more expensive) for distribution in conditions of humanitarian disaster. Because of the economic spin-off there will be financial destabilization in the wake of food shortages. That leads inevitably to political destabilization. So we have some really important issues to deal with that all stem from the implications of the phenomena we are now understanding in the terms of Arctic Dynamics. – Impact on Global Dynamics: What we see in the Arctic – runaway climate change – could be in store for the rest of the planet which, at the moment, is still in stasis. Once the “aerosol effect” or “global dimming” of industrial pollution is removed, we will see further temperature increases. Other positive feedback loops which are specific to various regions of the world could come into play like they have in the Arctic. The implications of jet-stream behaviour and Arctic dynamics could spin-off into our economics, into our food production, into abandonment of the poor, into the inability to sustain a population of 8, 9 or even 10 billion people, into our survival as a species. All this will inevitably follow unless we are able to intervene, to slow it down, to bring it to a halt and reverse it. Without that intervention, global dynamics hold a dark future for humanity and a dark future for the biosphere of which we are a part. It is time to take action, not only for the Arctic but for the whole global crisis in which we are all involved.